>> EdgeStar Wine Cooler Reviews: Is It Right for You? EdgeStar Wine Cooler Reviews: Is It Right For You? 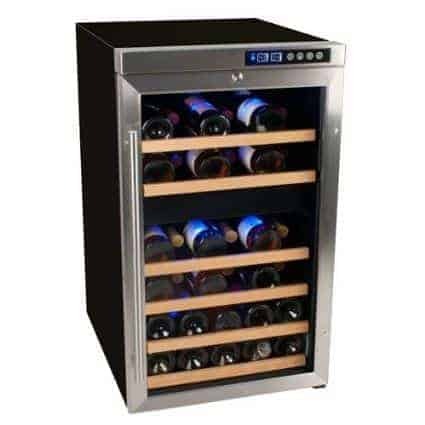 So you have decided that you want to take your to take your wine drinking experience the next level and want to invest in a EdgeStar wine cooler? Or perhaps you're just looking for a bit more information on EdgeStar (or Koldfront) as a brand. Either way, these EdgeStar wine cooler reviews should help you make a decision as to whether these wine coolers are right for you, and if so, which one. Let's have a little close look at what the above features actually mean. 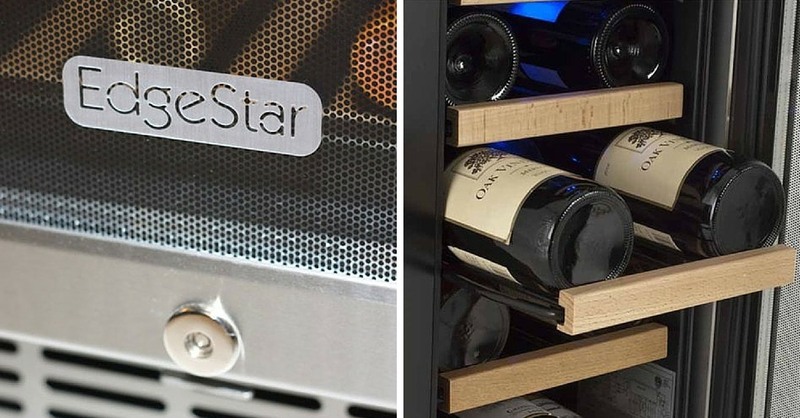 You might think it's great that most of the EdgeStar wine coolers feature a compressor-based system, or have an LED display, but what does that actually mean and what benefit does it bring? This one is fairly straight forward. This is the number of how many standard sized wine bottles that the wine fridge actually able to carry. As you can see, this can range from around 18 bottles to as many as 166 bottles. 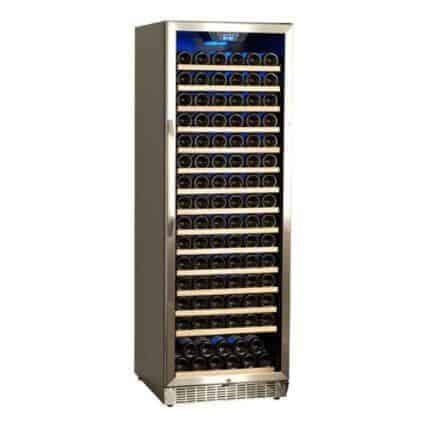 Depending on how experienced of a wine drinker you are, or the types of wine that you typically carry, you may have different needs in terms of total capacity of the wine cooler. Also note that the capacity is based on the number of standard Bordeaux bottles that the cooler will carry. If you would like to carry larger sized bottles, you may have to remove a shelf in which case the capacity would decrease. Quick Tip: If you're fairly new to the world of wine but are interested in starting to build a collection, I would recommend going with a wine cooler that holds at least 30 bottles. The last thing you want is to invest in a smaller wine cooler only to find out that it doesn't quite hold enough bottles forcing you to buy another one shortly after. If you're a casual drinker, however, and don't expect to ever want to start collecting bottles, a smaller wine fridge might be just fine. Most types of wine coolers can be divided into two camps when it comes to how they're cooled - compressor based cooling, or thermo-electric cooling. All of the EdgeStar wine coolers listed above use a compressor based cooling mechanism. Please see the table below for further detail on the advantages and disadvantages of both. Another important factor you should be aware of before purchasing a wine cooler (from EdgeStar or otherwise) is whether it has single- or dual-zone cooling. 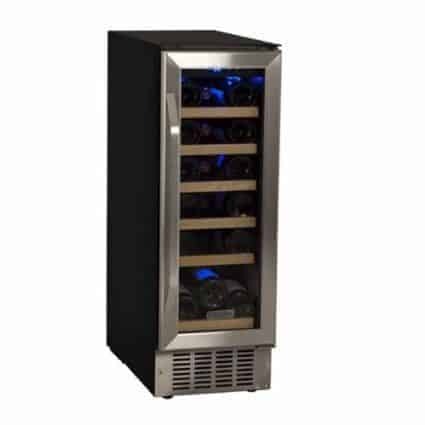 With a dual-zone cooler, the wine fridge is essentially divided into two chambers whose temperature can be adjusted separately. This is extremely useful if you intend on storing different types of wine (particularly red and white) in your wine cooler, as various types of wines will have different optimal serving temperatures. Quick Tip: For the majority of wine drinkers, a dual-zone cooler is optimal. Unless you strictly drink one type of wine (and all your guests and family members do too) a single-zone wine cooler will be fine. If not, a dual-zone cooler will ensure that you can keep two types of wines at optimal temperatures and enjoy them immediately as you take them out of the fridge. Many wine coolers these days will also come with tinted glass doors that are able to block the UV light from entering the wine cooler. As you may be aware, if wine comes into contact with UV light it may have an adverse impact on the wine. As such, having tinted glass is a nice feature to have and thankfully all the Edgestar wine coolers above have this feature included. You might be wondering where the brand EdgeStar comes from. It is actually a brand that is owned by a company called Living Direct which is active in the online retail space. It specializes predominantly in consumer appliances, lawn and garden products, and indoor air quality products and is headquartered out of Austin, Texas. Although EdgeStar itself is an American-owned brand which is also where all product design and development is based, the units themselves are actually manufactured in China after. In addition to making the EdgeStar branded wine coolers, they also manufacture wine coolers under the brand Koldfront. So what do we think of EdgeStar wine coolers? Please see the summary below. Summary: All in all, if you're looking for a good quality wine cooler at the right price, buying one from EdgeStar is a pretty reasonable option. 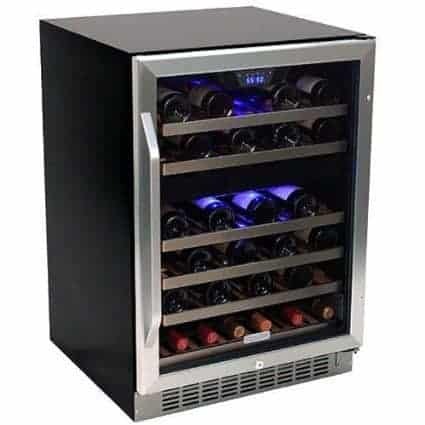 They have a fairly wide variety of wine coolers available, and most of them will look pretty sleek in your home. Some recommended changes from our side would be to extend their overall warranty (including labor expenses) to 1 year as this would give the consumer a little bit more comfort. Some prior reviews from customers also stated that they weren't completely happy with their level of customer service, although most of these are fairly dated. EdgeStar has since made an effort to improve the level of customer service that they provide. 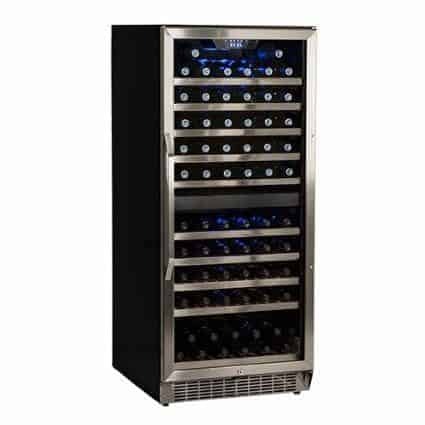 Wide variety and sizes available - The EdgeStar range of wine refrigerators is quite extensive with a fairly large selection available in terms of both sizes and styles. As a result, you're bound to find at least one cooler that will satisfy your requirements. Good LED controls - One of the advantages of EdgeStar's wine coolers are that they have a fairly straightforward and easy-to-use digital LED control panel that allows you to adjust the settings. Rather than messing around with a dial to adjust the temperature, the LED screen will allow you to set it digitally while at the same time also measuring the current temperature of the wine cooler itself. Labor warranty expires after 90 days - Although a 1 year warranty is given on the parts of the wine cooler, only 90 days of warranty is given on any labor that might be required to repair the unit that you purchased. Some competitor brands offer a full 1 year warranty, and I think it would have been a nice feature for EdgeStar to have done that as well. This would give consumers a little bit of extra peace of mind. Customer service complaints - A number of customers complained about the responsiveness, and willingness to resolve issues, from EdgeStars customer service. The majority of these complaints date back to 2011, and EdgeStar has actually stated that during this point in time the company underwent very rapid growth to the extend where servicing the customer was often times unable to keep up. Significant investments have since been made in customer service, and the number of complaints has reduced. Units can be a little loud - ​Since the units listed above are all compressor based units, they will be louder than their thermo-electric counterparts. If you're sensitive to some background noise, and you're planning to place your near your living room, you might want to avoid them and go with a thermo-electric wine cooler. If you're just starting out, don't plan to ever hold more than 10 bottles, or will be placing your wine fridge in your living area, I recommend going for a smaller and thermo-electric alternative. If, however, you're looking for a reasonably priced and poweful wine cooler, and you're looking to take your wine collection to the next level, I would recommend going with EgdeStars wine coolers.